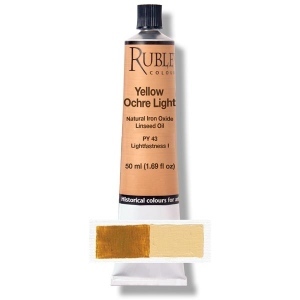 Details Rublev Colours Yellow Ocher Light is a transparent golden yellow, fine grained and brushes "long" in the direction of the brush stroke. Our French yellow ocher is a single pigment color made of natural earths from the last remaining European company operating the ocher deposits in the French quarries of Gargas and Rustrel nestled in a 12 mile long enclave in the heart of the Luberon Massif, the ocher country. Hydrated iron oxide is the principle coloring agent in yellow ochres. This color is based on the natural mineral goethite associated with varying proportions of others mineral such as clay, chalk and silica. They differ from other ochres in that they contain water. In other words, the iron to which they owe their color is hydrated iron oxide. Note: Colors swatches are shown in mass tone, straight from the tube, on the left, and mixed with an equal amount of white on the right. All pictures of color swatches in this web site are only approximations of the actual color of the oil paint. We taken every care to match the color in these pictures on calibrated color monitors to the actual color. However, because of the wide variance in color monitors the results you get may vary.